Located only one mile off the Venetian mainland is the small island of Murano. Murano is best known for the production of beautiful glasswares that date back to the tenth century. Although, highly skilled glassmaking has been a main contribution to Venice’s legacy, early glassmaking techniques and can be traced back to the Roman Empire. [i] In the fifth century, populations of city-states in the Roman Empire began to flee east to escape barbarian invasions. Many found refuge in the areas of the Venetian lagoon. One group of refugees was the Roman inhabitants of the town of Aquileia on the Adriatic Sea. Aquileia was noted for its glassmaking. [iii] As communities such as these grew, glassmaking began to expand into northeastern parts of Italy, specifically Venice. After the Goths sacked Rome in 410, “Glass art in Europe, like other more sophisticated craft arts, experienced a long period of decline both in terms of quality and quantity of production, though it never disappeared all together.”[v] However, glassmaking was revived in the late Middle Ages and Venetian glassmakers began to outshine their rivals. In the year 1292, all glassmaking in Venice was restricted to the island of Murano in order to prevent the spread of fire created by glass furnaces on Venice proper in an ordinance written by the Venetian Maggior Consiglio (Grand Council). [vi] Venice’s reputation as a pioneer in glass making begins with of the works created in Murano at this time. Glassmakers working in Murano produced pieces that featured intricate designs in numerous shapes and decorated in multi-colored enamels. [vii] This creative spirit in glassmaking has made Venice most notable for its creations in glass throughout history. [i] Phillips, Phoebe. The Encyclopedia of Glass. New York: Crown Publishers, 1981. [ii] Norwich, John Julius. 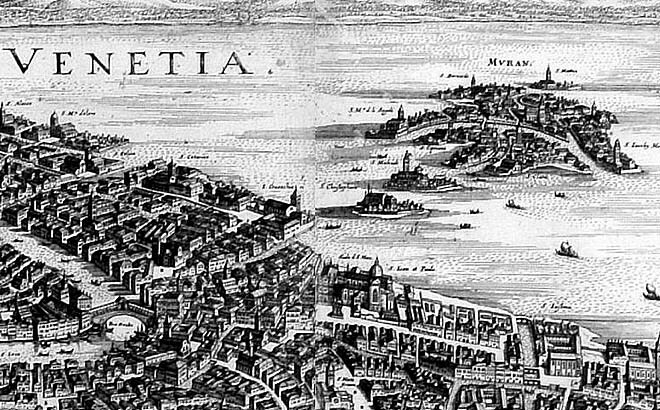 A History of Venice. New York: Vintage Books, 1982. [iii] Barr, Sheldon. Venetian Glass: Confections in Glass, 1855-1914. New York: Harry N. Abrams, 1998. [v] Mentasti, Rosa Barovier. Glass Throughout Time: History and Technology of Glassmaking from the Ancient World to the Present. Milan: Skira, 2003.